Roger stopped eating. At the turn of midnight 2 days ago he lost all interest in food. The temperature fell below zero in the night, the water in the bird bath had frozen solid and Roger had pneumonia - again! Before there was time for self-pity to kick in he was moved to the Quail brooder in the kitchen faster than the blink of an eye, faster than a Roe deer taking flight and certainly faster than Roger moved on an average day. ACTION: Keep warm and dry in kitchen; Start regime of Baytril (oral antibiotic) 0.5ml twice a day for 7 days; start Septrin (sulphonamide and antibiotic that deals with certain bacterial infections and also protozoans that cause Coccidiosis, indicated by green poo); Start Telmin for lung worm, Crenosoma striatum,(1 ml a day for 5 days); syringe feed esbilac several times a day to keep Roger hydrated. N.B. 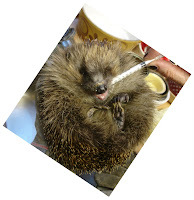 When syringe feeding it is always best to hold a hedgehog in the most upright position possible. This prevents any liquid from being breathed in by accident. This is particularly important with baby hedgehogs that can develop inhalation pneumonia by inadvertently breathing in fluid which then reaches their lungs. With Roger this was the only position that worked, though I tried to hold him more on one side whenever possible. Joss passed away over night. Help had arrived too late. 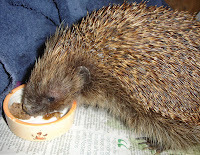 By the time he arrived at the hedgehog sanctuary he had been starving for days and possibly weeks. Despite every effort being made, nothing could save him. Heartbreaking to see and so frustrating. If only he had been found sooner and been taken into the warm and safe surroundings, aptly named 'sanctuary'. ACTION: Many people see hedgehogs wandering about in the daytime for several days before they decide to act. This is not usually due to a lack of caring but because they see posters telling them not to pick up baby birds they see on their own, as the parents will be watching the baby, just waiting for the person to go so they can return to feed their baby. This is completely true. The same is also true for young foxes and deer. The mother will be watching and waiting near by and unless the young fox or deer is obviously in distress or injured, it should be left totally alone. However, the same is not true of hedgehogs. Any hedgehog found out in the day is desperately in need of help. At this time of year, any hedgehog found out in the day, or hedgehogs weighing less than 500g, should be taken into care. The minimum weight that a hedgehog is expected to be before hibernation is 600g. At the moment, in Britain, it is quite mild and in Yorkshire hedgehogs do not appear to have started to hibernate. Those weighing less than 500g at the moment, will most likely not gain enough weight to be able to survive hibernation. Roger couldn't quite believe his meteoroic rise to fame. It was hard to take in for a humble hedgehog such as himself. One minute he was going about his normal humdrum existence - sit and wait each morning for breakfast, his house to be cleaned, his bed to be made up nice and fresh, just as he liked it, supper laid on in the evening.... in a word all his needs were met and he wanted for nothing - the next minute, without a word of warning, he was propelled into the limelight. He had always wondered what was meant by 'the limelight' and now he knew. On Wednesday November 25, 2009, he was abruptly woken from his morning slumber to find a television camera aimed directly at him. But Roger was not a hedgehog that was phased easily. He took it all in his stride and posed for the camera, taking care to always show his good side. Having performed for the camera he went back to his bed and slept for the rest of the day. Little did he know that he had been catapulted into the stratosphere of the world of fame, and had done his bit to highlight the plight of hedgehogs in Britain today. All throughout Yorkshire people watching Look North on their televisions that evening commented on how calm and collected Roger had appeared for what was actually his debut in the world of television. Roger had become a star!! Joss was taken to the vet yesterday as he is losing weight and hadn't had a good night. He slept better last night, wrapped in a very cosy, soft blanket, and half on a heat pad to make sure that he didn't feel the night chill. Fingers crossed that he makes it but it isn't looking good at the moment. ACTION: At vet yesterday: subcutaneous fluids administered; injection of Droncit for intestinal flukes; syringe-fed Esbilac milk substitute at regular intervals; started Septrin (a sulphonamide that kills protozoan infestations such as those that cause Coccidiosis) yesterday also (0.5ml once a day for 5 days) as signs of Coccidiosis infection; heat pad on day and night but able to move off it easily if he gets too hot. Hedgehogs can't sweat so it is important that he doesn't overheat. That was a narrow escape thought Joss. Snatched from the streets of York on a freezing cold day with not a heat pad to be seen anywhere he arrived to a warm welcome and a nice bed. On his spindly legs he looked quite tall, as hedgehogs often do, but curled into a ball he looked tiny. Born to one of the late litters he had had a narrow escape, but he was not out of the woods yet. ACTION: Weight on arrival(Dec 6) 241g; 1 tick removed; very thin; syringe fed esbilac, as much as he'll take (normally about 10ml 3 times a day); Day 3 (Dec 8) started on Telmin (0.5 ml once a day for 5 days) for worms; not eating any pedigree chum puppy food, just dried biscuits (Iams) and esbilac; kitchen with heat pad on day and night. Minimum recommended weight needed to survive hibernation = 600g. Things were looking good for Amos and Billie. After 10 days on the brilliant new regime for treating mange and ringworm their spines had stopped falling out! To be honest they still looked pretty moth-eaten and Billie, in particular, had no desire to be seen out in public at the moment. He tried to hide his bad hair under the blanket but couldn't resist scrambled egg, when it arrived warm and smelling very appetising, temporarily forgetting his bad hair and rushing out to tuck in to the feast. At this stage they had also put lots of weight on and become a little chubby looking which could only be a good thing considering how they had started out. Amos now kicked in at 273g (52g heavier) and Billie, in the other corner, at 263g (80g heavier). To say they were feeling happier with life would be an understatement! ACTION: Continue with occasional applications of Tea Tree antiseptic cream and Neem oil to bald areas. ACTION: Vet for Ivermec injection to kill mange mites; Tea Tree antiseptic cream dripped sparingly onto bald areas to kill mange mites and ringworm (which is caused by a fungus); Neem oil also used as recommended for these skin conditions; started oral administration of Baytril (0.2ml twice a day for 7 days) to help healing of abscesses.